Jason Holder won the toss and chose to bowl. Their U-19 star, Alzarri Joseph was handed debut. Leon Johnson, and not Shai Hope, was incorporated to partner Kraigg Brathwaite at the top of the order. The out of form Devendra Bishoo was handed the axe. Shanon Gabriel and Alzarri Joseph shared the new ball and it was only a matter of time before Dhawan edged a benign delivery down the leg side to Shane Dowrich. Kohli came out at No. 3. But he did not last long either. In the sixth over, a rising delivery from Joseph got the better of the opposition skipper, who presented a straight forward chance to Darren Bravo at first slip. 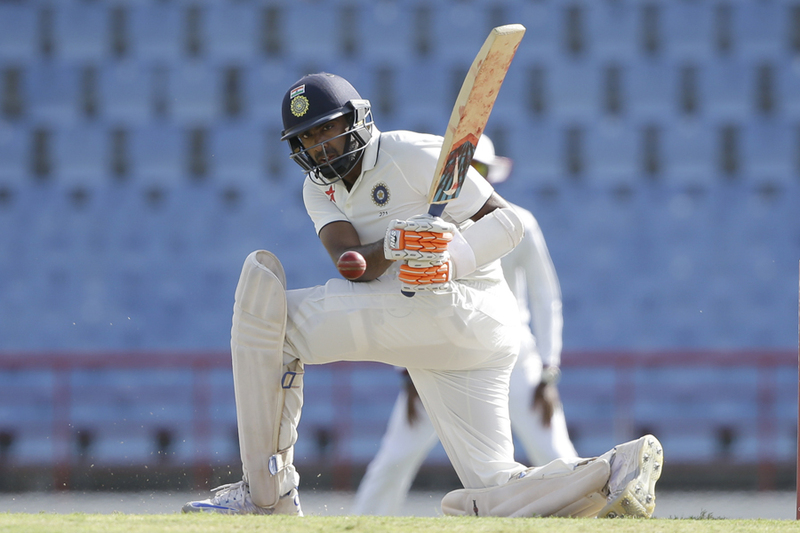 Ashwin would be looking forward to his fourth century versus the hosts. It was not the first time Ajinkya Rahane was coming in to bat in such a situation. He calmed the situation at one end but it was Rahul, who displayed signs of aggression at regular intervals. He once again got a start and was looking good to convert it into a big one. He completed his half-century in the 20th over but fell prey to Roston Chase's fielding placement on the next ball. His well made 50 runs came from 66 balls with six boundaries. Finally, the wait was over for Rohit Sharma who had a perfect opportunity to rescue his team from the clouds of danger. But just after lunch, he fell to Joseph after edging a full delivery to Dowrich. Ravichandran Ashwin joined Rahane and the duo provided some stability to the innings. The partnership lasted for 23.3 overs which yielded 39 runs. Rahane once again perished to a false stroke against Roston Chase. India was reeling at 126-5. The onus came on Ashwin and Wriddhiman Saha. The duo added 108 runs in 40.3 overs till Stumps - Day 1 helping India to reach 234-5 in 90 overs with Ashwin unbeaten on 75 and Saha unbeaten on 46. Day 2 might well be the deciding day of the match. With Jadeja and Bhuvneshwar still to come, India will be thinking to add at least 120-150 runs to their total. On the contrary, West Indies would be looking to dismiss the tail for not many runs in their quest to build a first innings lead.